Five Loaves and Two Fish (5L2F) Many thanks to all those who helped with our 5L2F mission project! We successfully fed 10 families at the Stafford Park Apartments on Thursday, July 19th. We could not have provided food without your generous donations of non-perishable foods and ShopRite Cards. Also, the organizers, packers, and distributors were wonderful donating their time—Thank you all! 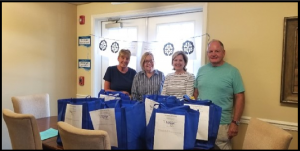 In addition to those families who received our pre-packed “food bags”, we donated many excess items to the St. Francis Food Bank on LBI (we have to manage our supplies and expiration dates ). Our hope is that our mission will gain traction after Thursday’s event and we will regularly supply food to those in need in Stafford Township. Our goal is to regularly support 20 families with children. If you would like to donate food or Shoprite Cards, please notice the blue food box in the narthex. You can also see Lynn Demenchek or Alison O’Brien for Shoprite Cards after the Sunday services. If you want to help with food collection, packing, or distribution, please call Alison O’Brien at 609-488-2456.